Around our home, no surface is safe from clutter. In the blink of an eye our flat surfaces can end up being blanketed with mail, art supplies and random junk from the five people that live in this home of ours. Uncluttered spaces are what my dreams are made of and actually are only a few steps away too! We simply need to put in place a handful of creative ideas to achieve Instagram ready tables in our home. If you and yours struggle with the same cluttered areas, and aim to quiet the visual noise in your spaces than look no further! Your cupboards and closets have all the answers to banish table top clutter. By utilizing the forgotten containers your home is hiding, you’ll easily create visually appealing surfaces. Our coffee table and yours too are just begging to be Instagram ready coffee tables. Don’t search for hours on end when you want to PVR your favorite shows any longer, simply use an old basket to add a textured detail to your coffee table and pile in your television remotes. You’ll love how this simple task will save you time and effort when you are in the mood to relax. Movie night in with the family has never been easier! To keep your kid’s art supplies from sprawling and falling all over your living room floor use that pretty vase you have stashed away in your cupboard to hold your well loved and used pencil crayons. You will immediately love how the colored crayons add a pretty tone to your table top and your kids will love that their crafting materials are easily accessible. To add a bit of pretty to your table, without breaking the bank, look no further than the crisper jar in your fridge! Pile up a bag of big, green, shiny apples into an old wooden salad bowl or add some contrast by filling a pretty ceramic salad bowl with bright lemons or fruit in a different contrasting color. You will love how often you and your family will reach for fruit instead of rummaging around for treats in the pantry too! 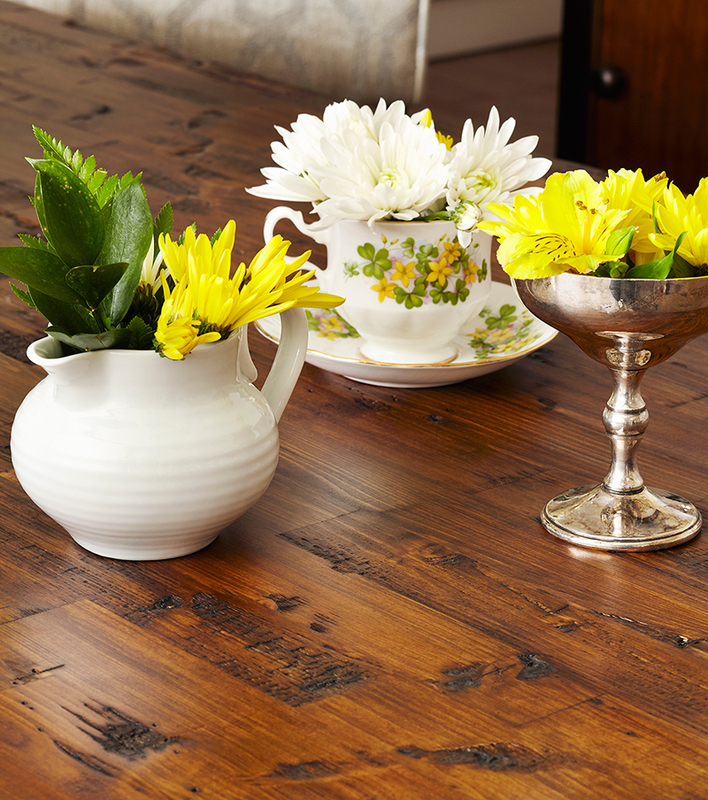 To add some life, movement and height to your coffee table, try snipping some backyard flowers or tall grass and place them in a clear jar or vase on your table. You will love bringing an out door element indoors and your eye will be drawn to the pretty green tones. Summer never looked so good! It doesn’t take a lot of work to create a clutter free coffee table surface. All you need is an open cupboard an open mind and a want to put a creative spin on ordinary objects. Busy homes can be pretty too.